Crowdsourcing in fund management and trading is the move to utilize anyone with an internet connection to participate in the research with the goal of finding new and better ways of trading. During the discussion the differing approaches being taken with the business models, and the technology, and the challenges each are facing. 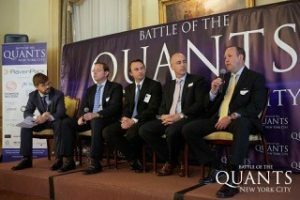 CloudQuant is utilizing a partnership approach that allows the algo creators to build proprietary algos, backtest them, and to prove their worth. Once the algo owner is ready, he or she can submit the algo for funding. This works best at scale. Many data scientists can find ways to invest and trade but are unable to achieve the scales necessary to extract profits from the market. When CloudQuant licenses an algo it is with full intention of providing the capital required to achieve large scale trading. Talent is coming from all over the globe. Those building algos are sometimes highly trained individuals with quantitative trading backgrounds. Sometimes they are also data scientists who are looking for new challenges. Sometimes they are software engineers. Sometimes accountants. The interesting fact is that with access to the backtesting and research tools anyone can now begin to test a trading strategy. Learn more about the CloudQuant business model and how you can benefit from being a crowd researcher.